Medang kok is a native of the South East Asia. It is cultivated as a back yard fruit in Ithe Philippines, sometimes in appreciable numbers. The fruit is also offered for sale in local markets. An erect, evergreen tree, 12-35 (-54)m tall, trunk 35-80(-100) cm in diameter, with angular branchlets and prominent leaf scars. Leaves elliptic to oblong –lanceolate, (5-)15-43cm X 2-11cm, coriaceous, glabrous, dark green above; base cuneate, margins entire; apex acuminate, mucronate or obtuse; midrib and nerves prominent veins reticulate; petiole 1.5-5(-9) cm long . Inflorescences terminal or axillary panicles, crowded at apex of twings, 10-25 cm long, glabrescent; pedicels up to ca. to mm long; flowers white or creamy white, in groups of 4-5 on secondary branches, male or bisexual; bracts triangular; calyx 4-lobed, lobes ovate-oblong 1.50-3 mm long, glabrescent, persistent petals 4, ovate-oblong,3-5 mm long glabrous; disk 4-lobed and papillose; stamens 5, 1 fertile, free, 2-3 mm long; style 2-3 mm long, excentric. Fruit an ellipsoid to ovoid drupe,5-8 cm x 3-6 cm, weight about 40 g, green turning yellowish; peel tender, up to 2.7 mm thick; flesh slightly fibrous, white, resinous, acid to slightly sweet. Stone 4.2-4.8 cm x 2.3-2,7cm x 0.8-1.5 cm sparsely fibrous. 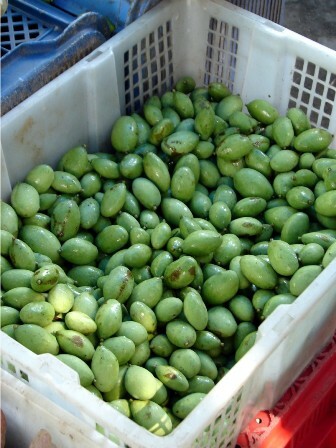 The unripe fruit is eaten fresh, pickled or mixed with vegetables. The ripe fruits are eaten or used to prepare marmalade. The edible portion comprises about 75% of the fruit and contains per 100 g: water 85 g, protein 0.7 g, fat 0.6g,carbohydrates 16.4g, fibre2.3g, ash0.5g, calcium 95mg, phosphorus 17mg, riboflavin 0.1mg, niacin 0.4 mg, phosphorus 17 mg, iron1.2mg, vitamin A 131 IU ,thiamine 0.06 mg, riboflavin 0.1 mg, niacin 0.4 mg, vitamin C93mg. The seeds are salted and pounded to obtain an edible meal. The wood is used for general construction work and indoor woodwork. It seasons well, is easy to work and rakes a beautiful polish. The heartwood is durable for interior work but very perishable when in contact with the ground. The sapwood is very susceptible to damage by dry-wood termites. 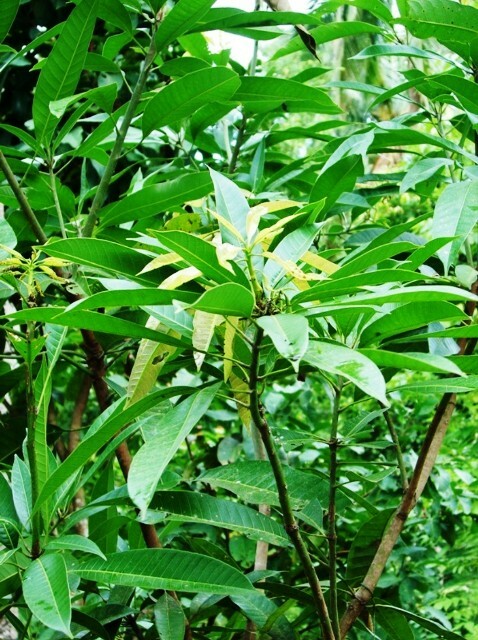 The propagation is mostly by seed although it can be readily propagated by cleft grafting on its own or mango roots. Grafted trees remain much smaller and have a more compact crown than seedlings..
Medang kok seems to be much hardier than mango as the common mango pests like leafhoppers, tip bores and seed borers do not affect this fruit..